This week we launched our latest feature release, SIMUL8 2018. I’m really excited about this release as it’s packed full of features that our users will use in every simulation you build! I’ve been lucky enough to have hands-on time with all the new features over the last few months and in this blog post I’ll share my thoughts on each and explain the key benefits for SIMUL8 users. Keep an eye on the blog over the next few days as I’ll also be showing you how to use each of the new SIMUL8 2018 features in a series of short how-to posts. Quick Build is a really interesting addition to SIMUL8’s power features but also something that will help our new users to try out rapid simulation development. As the name suggests, this feature will automatically produce an entire simulation based on parameter data that you pre-fill in a sheet. As soon as you have added all of your Activities’ names and selected their key characteristics, with one click SIMUL8 will instantly add and connect all of the simulation objects that your process needs – without you having to manually add any objects on screen! Truly revolutionary, if you are looking to simulate a large process or lots of individual processes with similar structures, or even in general if you already have a lot of your process data to hand and you want to get to decision making and solutions faster. What’s great about Quick Build? Automate and roll out massive simulations at the touch of a button. Labels are how we tag work items with attributes in SIMUL8. They are a fast and flexible way to represent different product types or important factors like the age of a patient, the size of a part or the shipment date of a delivery. Once tagged, we use Labels to set process rules like routing, cycle times, or priorities. A popular feature with both new and experienced users, the number of ways that Labels can be used in SIMUL8 has gradually expanded so it now makes sense to have a centralized place for quickly viewing and editing all your Labels and all of their functions. Operating as a single-window interface, the Central Label Editor is really impressive in terms of simplicity and speed for setting up and tracking Labels. Frequent operations such as creating a Label, attaching it to Activity and setting it to control routing can now be achieved in just seconds and without jumping through multiple windows. It is so fast that even as a proficient simulation developer, I am already hooked on using the Central Label Editor! It’s saving me time on every simulation and the best part is that I can instantly see where all of my Labels have been applied and I can edit them all from one place. What’s great about the Central Label Editor? Routing, priorities, shelf life, wait times, you can manage and map all Label actions from here. Much faster and simpler to use; already saving me 20 – 30 minutes per day, or 130 hours per year! Routing Out By Label has always been a favorite SIMUL8 feature to select the pathways that different types of work items will go to. I use this feature in every simulation I work on as it’s useful for functions like splitting customers into different lines, sending parts to the correct production line or directing calls to agents in a contact center. Now, Route Out By Multiple Conditions adds even more power to this feature, making it a better fit for more customized processes and providing everything you need to simulate the more flexible systems in fields like Industry 4.0. For example, if your process rules require an ‘If’ statement to determine routing or even if you want to refer to a formula or multiple other Label values to work out where work items should go, all of these options are possible with no coding or spreadsheets needed. What’s great about Route Out By Multiple Conditions? Works with any data item, any variable, opens up a massive number of options for routing control. Much easier to represent real-world routing rules e.g. express items, re-working, products with custom options, alternative routing for night shift, High-Mix Low-Volume, etc. Much, much faster than using Visual Logic or spreadsheets to set these rules. Using Route Out By Sequence provides an easy way to set the destination work items will be routed to by defining a repeating sequence that specifies exactly where each work item will go. As an addition to the existing routing options this will give you more control for scenarios where a repeating cycle of routing choices is expected. For example, you could use the feature to easily simulate a security gate that is setup to stop every 5th passenger or represent a robot that always offloads a palletizer to multiple machines in a set order. Linking this with batching, where we multiply the work items on output, Route Out By Sequence also becomes a fantastic new way to represent process steps where multiple and various output items are produced. Think of chemical reactions in a lab, or offloading a processes oven or even emptying cargo from an aircraft, with Route Out By Sequence we can test out the order that the produced items from these events are handled and seek out where faster, more efficient and better process performance. What’s great about Route Out By Sequence? A whole new way of routing and great for automated and sequence based systems. No coding or spreadsheet needed, really intuitive to use and fast setup. Quickly compare and find faster, more efficient and better process sequence options. Replacing SIMUL8’s Day Planner feature, the Arrival Planner works with Start Points to set the arrival rate by defining the number of arrivals you want to occur within a specific time frame. For example, if you want to see 20 new work items between 9am and 10am, followed by 40 work items arriving between 10am and 11am. What’s new with the Arrival Planner is that the time frame is no longer limited to being set as minutes and hours, so arrival volumes can be set for days or weeks just as easily. This will help you to reach solutions even faster, so you can explore your process behavior in detail over the span of a single day, to across multiple months or years to test out seasonal variation and supply chain issues. Typical analysis tasks like comparing a low volume week against your busiest week or testing best-case / worst-case capacity planning over a whole year just got a lot easier with these new options! What’s great about the Arrival Planner? Much easier to use for setting daily or weekly arrival volumes. Reach solutions faster by exploring arrival behavior from days to months or years. Can be edited in seconds and has copy & paste functionality for spreadsheet data. A highly requested feature by our users, SIMUL8 2018 delivers a better way to use Labels to set the cycle times at Activities. This makes a lot of sense; if we are already using Labels to define different types of work items, like different products, patients or automobiles, then why not use this to control the process times of an Activity? That is how Activity Timing By Label works; as an alternative to giving an Activity a universal process time for all items, the process time is based on the type of item itself (i.e. the Label value). Just like real life, we can give an Activity a shorter process time for one item type and longer process time when handling a different item type like offloading a small truck versus offloading a large truck. Power users will also be interested that Activity Timing By Label allows for different timing distributions types to be selected for each Label value. This means you can now use a Triangular distribution for one product type and a Log Normal distribution for another – a first without needing coding or spreadsheets. What’s great about Activity Timing By Label? Gives you all of the controls you need to quickly add and edit variable process times. You no longer need to use coding or spreadsheets so much faster and much easier use. Can you see why I’m so excited about this release? I think SIMUL8 2018 is full of fantastic features that will allow everyone to really take advantage of the full power of simulation. SIMUL8 2018 will enable beginners to easily start simulating their processes, while experienced users will be able to build simulations in less time than ever without compromising on the power and flexibility of SIMUL8. Every feature will be useful for any simulation that you build and will enable you to focus on what matters most – making better, faster, evidence-based decisions. 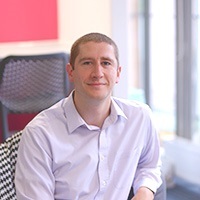 Liam Hastie is a Specialist Consultant at SIMUL8 Corporation providing insight, support and skills to help you get the most from process simulation. With a Masters in Industrial Design Engineering and over 10 years’ experience in Lean Six Sigma Process Improvement, Liam offers unique perspective on how to use simulation to boost your process improvement projects and transform your decision making.